jBPM is completely open-source and therefore most of my blogs are typically about the latest and greatest feature that was just introduced in the community. However, Red Hat also offers a supported version, with the testing, certification, and maintenance releases necessary for enterprise production use (for a quick intro on potential differences, take for example a look here). And recently, as announced in this press release, Red Hat unveiled Red Hat Process Automation Manager 7. The most obvious change you might notice immediately is that the product was renamed - formerly known as Red Hat JBoss BPM Suite. Since jBPM has evolved beyond just BPM - with features such as decision management, case management and constraint solving closely integrated - it was time to also reflect that in the product naming. Similarly, Red Hat Decision Manager 7 was released a few months ago, focusing on the Drools and Optaplanner bits. However, nothing changes structurally. Red Hat Process Automation Manager is based on jBPM (to be more precise, it was based on the jBPM 7.7.0.Final release) and actually is a super-set of Red Hat Decision Manager, so it also includes all the rules and constraint solving capabilities as well (Drools and Optaplanner). Since it is completely open-source, you will see the same set of components there as you see in the community: the process execution server (kie-server), the web-based console (business-central aka the workbench - for both authoring and runtime deployment and administration), smart router, controller, Eclipse tooling, etc. OpenShift images and templates (supporting these capabilities in the cloud) are available too for those targeting cloud deployment. Red Hat Process Automation Manager also includes an advanced open source user experience platform from Red Hat partner Entando. It can be used to quickly develop modern UI/UX layers for user interaction with business process applications, including a drag & drop UI development tool with widgets to create task lists, forms, process graphs, etc. Red Hat Process Automation Manager is part of the Business Automation portfolio, which includes Red Hat Process Automation Manager and Red Hat Decision Manager, but also the Red Hat Mobile Application Platform and in the future also big data analytics through Daikon. More questions? Take a look at the product pages ! I am very glad to be able to announce that Maciej (aka "Magic") Swiderski will officially become the new jBPM community lead. Well deserved, and long overdue ! Congratulations Maciej. PS: I'm not going anywhere in case anyone is wondering, still 100% involved, but given Maciej's continuous focus on the community and with the team growing this is the right move ! BBVA is a Red Hat Innovation Award 2018 winner ! Today, BBVA was announced as one of the Red Hat Innovation Award 2018 winners ! BBVA is a customer-centric, global financial services group based in Spain. 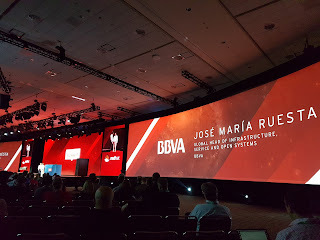 BBVA chose to make Red Hat technology a key piece of its new cloud platform. BBVA built its platform using several solutions, including Red Hat OpenStack Platform, Red Hat OpenShift Container Platform and Red Hat JBoss BPM Suite. You can ready the full success story here. As a result, we have been working very closely with them over the last year, and very excited to see all of that hard work showcased here! I have a presentation on Thursday with BBVA on this topic, see if you are attending Red Hat Summit, hope to see you there ! 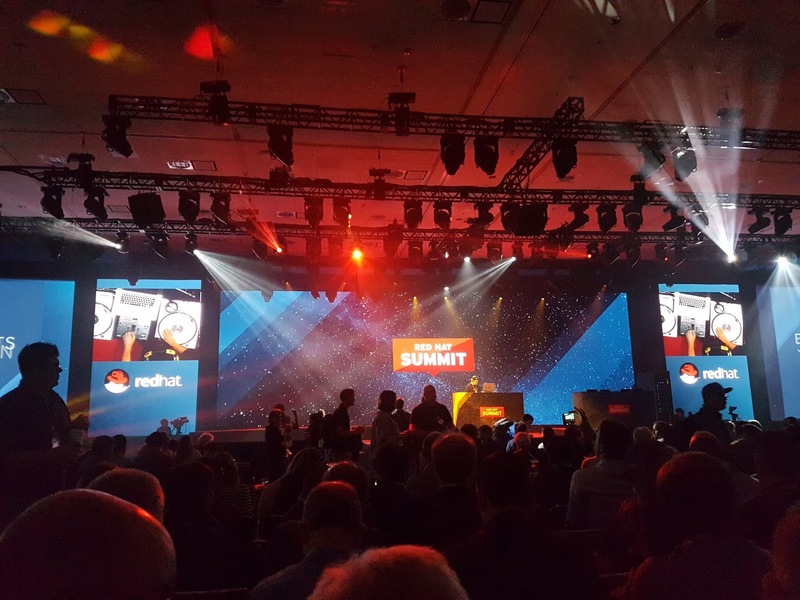 This year, Red Hat summit is again in San Francisco, and I'm excited to be able to attend again. We're kicking off today, but I personally have a presentation on Thursday afternoon (co-speaking with a customer on our BPM cloud strategy), and a jBPM Birds of Feather session on Wednesday with Maciej (where anyone can just walk in to come and talk or ask questions), but more about that later. We're kicking off with the keynotes. 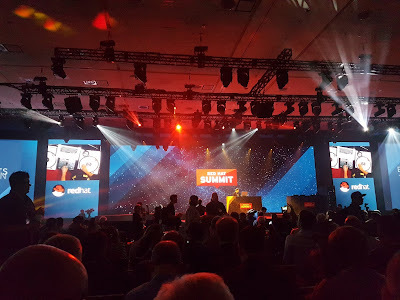 If you're interested, you can watch the keynotes live at https://www.redhat.com/en/summit/2018 (or in replay later). This first keynote already includes a live demo (by Burr Sutter and team) showing a true hybrid cloud (combining private and public cloud). And an awesome extra: this year Business Optimizer (Optaplanner) is used for scheduling all the different sessions, and got a honorable mention by Jim Whitehurst during his keynote. "It really is a fenomenal tool!" Business Optimizer is part of our Red Hat Process Automation Manager product (formerly known as Red Hat BPM Suite). Congratulations to the team! This year has record attendance (7.000+), a ton of breakout sessions (325) and even more opportunities to talk to the experts directly. If you are around and would like to talk, we'll be happy to see you in one of our sessions ! There's quite a few people from our team here, to try and help you with whatever questions you might have. So just reach out (at the booth or through social media) and we would love to hear your thoughts. Hope to see you here !